Recipe for Rose Hip Marmalade. This unique marmalade from Jackie Carroll is best known for GardenGuides.com make a great gift. 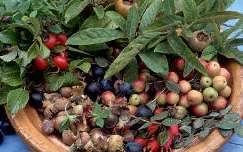 To prepare rose hips, cut off the bloom stem, cut the hip in half, and scrape out the seeds and hairy pith. This can be very tedious with tiny hips, so you may want to save the smallest hips for jellies. Rose hips used for jellies don't need to be seeded or scraped. A half and half mixture of rose hip juice and apple juice makes a tasty jelly. However, for marmalade, clean your rose hips and soak in cold water for two hours. Bring water to a simmer and simmer for two hours. Strain and reserve liquid for jellies or other recipes. Measure the mash, and add 1 cup of brown sugar for each cup of mash. Boil down to a thick consistency. Pour into sterilized jars and seal.